As we prepare for our upcoming holiday feasts, our thoughts go out to those who are serving our country and are unable to be with their families for the holidays. We give thanks to them and to their families and hope they all get to enjoy a special meal wherever they may be. In an ironic twist, one of the latest settlements in the government contracts fraud arena involves a company that agreed to supply produce to our servicepersons. The allegations are yet another reminder of the very real impact of government fraud, which takes money from taxpayer-funded coffers and, in the case of defense contract fraud, depletes funds needed for our nation’s defense and the protection of those who serve. We believe those who blow the whistle on government fraud are, like the men and women in the military, true Americans and our defense contract fraud law firm is proud to help. Earlier this month, the Department of Justice (“DOJ”) announced that Coast Produce Company (“Coast”), a California company, agreed to pay $4 million to resolve contract fraud allegations. The settlement applies to both civil and criminal lawsuits alleging False Claims Act (“FCA”) violations and claims Coast obstructed a federal investigation. Coast also agreed to institute measures to ensure future compliance. It is important to note that Coast did not admit wrongdoing and the claims in the various suits remain allegations only. As the DOJ press release explains, Coast entered into contracts to provide fresh fruit and vegetables to certain military dining facilities and Navy ships in California. The agreements allegedly state that Coast could only charge its own cost for the produce plus a fixed per-unit fee of $1.50. According to the lawsuit, Coast overcharged the military in three ways: 1) Instructing suppliers to provide inflated price quotes that Coast submitted as support for their prices despite instructing the suppliers to actually charge Coast less; 2) Charging the military more than its cost for certain fruits; and 3) Submitting artificially inflated price quotes, often from vendors Coast did not intend to work with, to justify a higher price despite actually purchasing the produce at a lower cost and keeping the difference. An industry consultant filed suit against Coast using the qui tam or whistleblower provisions of the FCA in 2008. After investigating, the government decided to intervene in the action and eventually negotiated the $4 million settlement. The government did not claim Coast’s produce was unsatisfactory, just overpriced. Additionally, the government asserted that Coast provided it with fake invoices during the investigation. Those claims have been deferred and will be dismissed in two years if Coast institutes certain compliance measures and does not violate its government contracts. The DOJ reports that, pursuant to the FCA, the whistleblower will receive $920,000 from the settlement money. 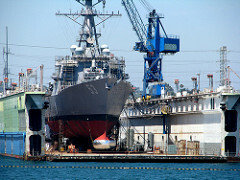 In the press release, an agent involved in the case explains the reason taking fraud seriously: “Overcharging the Department of Defense is always reprehensible because it drains precious funds and resources necessary to protect America’s warfighters.” Discussing the Coast settlement, the Navy Times notes that Coast is hardly the only defense contractor to be charged with fraud. The privately-produced newspaper cites a pending investigation into claims a port services contractor bribed Navy personnel using gifts, trips, prostitutes, and meals in exchange for steering ships to Asia-Pacific ports where the company then overcharged to the tune of $20 million. At least one company leader has reportedly pled guilty in that case. We live in complex times. At the holidays and throughout the year, we are thankful for those who volunteer to keep us safe. We, in turn, need to help keep them safe. Overcharging the military diverts funds from important activities, including efforts to protect our servicemen and servicewomen. If you are aware of or suspect defense contract fraud, call our office to learn more about the FCA. In partnership, our military contract fraud law firm and honest whistleblowers can make a difference.